The flurry of news, hypotheses, and disinformation about the nature of the Iraqi Resistance against the Occupation continues unabated. How much of this is managed propaganda against the Iraqi Resistance? According to both the Western mainstream media and the alternative media, the U.S. is “building democracy” and fighting “terrorism” in Iraq. The distortions of reality and lack of oppositional media leave people in the West, Americans in particular, ill informed. The Western media diligently diverts public attention from the illegal Occupation of Iraq and the responsibility of the U.S./Western governments for the horrendous crimes committed against the people of Iraq. Western journalists and pundits are the main agents of this distorted propaganda. The aims are to portray the Iraqi Resistance as violent “religious fanatics” isolated from the rest of the population and to advocate for ongoing occupation. Time and again, the public have shown to be less tolerant to the old clich? of “religious fanatics”. By contrast, people around the world have a record of supporting national resistance movements. In other words, portraying the Iraqi national Resistance movement as a collection of “religious fanatics” and “foreign” fighters “with nothing to lose” is the Occupation’s way of discrediting the Iraqi Resistance and denying the Iraqi people their legitimate right to fight for freedom and national sovereignty. Amply documented, the pretexts for the war and the Occupation were based on fake intelligence. Hence, the U.S. and its “allies” are in the process, through media disinformation, of not only legitimizing the Occupation, but also of creating new pretexts for the maintenance of continued US military presence. The most common pretext in the media reports is that U.S. forces are invited to stay in Iraq to prevent civil war and “maintains stability”. But like the pretext of WMD, there is no evidence to support these U.S. sponsored lies. There is a U.S-engineered stalemate with no one with a majority to govern effectively. The “government” is powerless dominated by the same groups of expatriates who lobbied for the invasion and occupation of Iraq. The U.S. is pitting Iraqis against each other and creating a climate of fear. In this regard, the creation, arming and financing of ‘ethnic militias’ and death squads by U.S. forces is designed to create ethnic divisions and provoke sectarian violence among Iraqis. These US sponsored militia groups are: The Kurdish Peshmerga whose leaders supported the U.S. invasion and Occupation. The Iranian-trained Badr Brigades, The armed wing of the Supreme Council of the Islamic Revolution in Iraq (SCIRI) led by Ibrahim Al-Jaaferi of the Da’wa party, The INC militia of Ahmed Chalabi, and the INA militia of Iyad Allawi. All these groups are involved in terrorist activities against Iraqi civilians. The latter three groups entered Iraq on the back of U.S. tanks, without valid Iraqi citizenship papers. Former U.S. administrator in Baghdad, Paul Bremer at the behest of Defence Secretary Donald Rumsfeld, former Deputy of Defence Paul Wolfowitz and Ahmad Chalabi initiated the murderous policy termed “DeBaathification”. The Bush Administration is not only supporting this murderous policy, it introduced the “El Salvador option” of murdering Iraqi dissidents through the appointment John Negroponte as U.S. Ambassador to Iraq. Chalabi, who never lived in Iraq before the invasion, stated that he “wants to raise Iraq from the ground and build ‘new’ Iraq”. What is taking place in Iraq today is a U.S-instigated criminal atrocity. “All day long, the soldiers pointed their guns at Iraqi civilians, whom they called ‘hajis’…. Wary of ambushes, they rammed cars that got in the way of their Humvees. Always on the lookout for car bombs, they stopped, screamed at, shoved to the ground and searched people driving down the road after curfew – or during the day if they looked suspicious”. According to a recent report by the U.S. Project on Defense Alternatives: “Strong majorities in the Sunni and Shiite community oppose the occupation – and significant minorities have registered support for attacks on US troops. ‘What drives these attitudes more than anything else’, says the report’s author, Carl Conetta, ‘are nationalism, the coercive practices of the occupation, and the collateral effects of military operations'”. The report, Vicious Circle: The Dynamics of Occupation and Resistance in Iraq, notes U.S. occupation abuses many Iraqis every day. Iraqis face: “Constant foreign military patrols – about 12,000 per week; Ubiquitous (and too often deadly) vehicle check-points; Raids — 8,000 total since May 2003; and Citizen round-ups — 80,000 detained since April 2003”. People have only one option left: Resistance. All resistance movements have been required to respond with armed resistance to defend against military aggression and occupation. Iraq is not different. Violent resistance arises from violent military occupation. It is easy for the U.S. “Left” and “Liberals” to pontificate about ‘non-violent’ resistance, but what is at issue is the violence committed by the occupying forces. This position arises from double standards and distortion of the underlying facts and points out a lack of solidarity on the part of those “progressive” groups in the West, who put the onus on the Iraqi people, who are defending their homeland against US imperial aggression. It should be borne in mind that the Martin Luther King’s statement that the U.S. “is the greatest purveyor of violence in the world today”, is as true today as it was then and all acts of violence and destruction in Iraq have occurred under aegis of U.S. forces. The U.S. press and Western media are focusing on civilian’s casualties with a view to discrediting the Iraqi Resistance. Regrettably, much of the coverage of the Iraqi Resistance in the Western media has focused on the U.S-created phantom groups of Al-Zarqawi and Al-Qaida network, called “radical Islamists” and “suicide bombing”. Yet despite the media hype, there exists no substantial evidence that these groups are active inside Iraq. Most of the attacks on the occupying forces have been attributed to the main Iraqi Resistance groups, and very few of these attacks were on civilians. Western media are only interested in car bombings that kill civilians. The reality is that occasionally the bombs missed their intended targets, which are the U.S military convoys. Anthony Cordesman of the Centre for Strategic and International Studies notes in this regard that 77 percent of all attacks were against military targets of the U.S. and “Coalition Forces”, and only 4.2 per cent of these attacks were led in civilian areas. According to Iraqi sources, in contrast to Western media accounts, most of the terrorist acts such as kidnappings and hostages attributed by the Western media to the Iraqi Resistance movement were actually carried out by the U.S-created militias. These reports also point to the role of U.S. and Israeli Mossad intelligence agents involved in a process of distorting the image of the Resistance. There is, in this regard, a growing body of analysis, which suggests that the various acts of violence and kidnappings attributed to the Resistance are part of a deliberate, and conscious propaganda effort by the occupying forces to distort reality. The strategy is to absolve the U.S. of any crimes and legitimize a prolonged Occupation. “Whenever major terrorist operations happened, it was mostly with US knowledge or involvement. Israel’s Mossad planned major terror operations in Iraq, recruiting 2,000 mercenaries before the war and sending them to various Iraqi cities to offer protection and support to the occupation forces”, reported the Egyptian, Al-Ahram Weekly. The hidden agenda is to blame the Iraqi Resistance for these attacks. In other words, the intelligence operation essentially consists in demonizing the Resistance movement, thereby weakening public support for it. Who is behind the violence in Iraq? U.S. forces and their Israeli agents together with the main militia groups, which now form the core of the new Iraqi army, police and security forces. People have often been found dead after the police and security forces have arrested them. According to Adnan Al-Duliemi, head of the Muslim Endowment, a religious organisation that supervises mosques and Muslim shrines, Iraqi Police Forces were “complacent about, even complicit with those killings”. He called on the “government to open an investigation into the killings. The U.S. and its allies have much to gain from a divided Iraq embroiled in sectarian violence. No investigation of these police killings has been conducted and the Occupation forces together with Western media blamed this orchestrated police violence on the Iraqi Resistance. These fabricated stories are fed into the Western news chain. They are used to portray the U.S fighting one group of Iraqi (Muslim) fanatics who see the U.S. as “infidel”, rather than as a violent occupier. Western media reports on Iraq are then linked up with 9/11 stories, namely that the U.S. had been attacked on 9/11, and that this war is “justified”. This type of reporting, which consists in dehumanizing the Iraqi Resistance, is aimed at a receptive Western audience, which shares the perpetrators frame of reference, to exploit an overarching climate of fear and prejudice, and in the process encourage more racism and Islamophobia. “The strength of the armed resistance is misunderstood outside Iraq. It has always been fragmented. Unlike the National Liberation Front in Vietnam or the Provisional IRA and Sinn Fein in Northern Ireland, it is not well organised…They have no political wing. The fanatical Sunni fundamentalists, commonly called the Salafi or the Wahhabi, see Iraqi Shias [sic] and Christians as infidels just as worthy of death as any US soldier. When American forces damaged two mosques in Mosul in the fighting last November, the resistance blew up two Iraqi Christian churches. Such sectarianism makes it impossible for the resistance to become a truly nationalist movement, but there are four or five million Sunni Arabs a strong enough base for an insurgency”. (CounterPunch, May 13, 2005). No corroborating evidence, no names, and no concrete documentation, however, are provided regarding the “fragmented” nature of the Iraqi Resistance aside from anecdotal news items, which invariably tend to downplay the violence of the Occupation, not to mention the crimes and atrocities committed by US forces. Moreover, why should the Iraqi Resistance be modelled on the Vietnamese NLF or the Irish Republican Army (IRA), which Western journalists tend to romanticize, in order to cast a bad light on the Iraqi Resistance? Both, the IRA and the NLF were also involved in countless violent acts, which resulted in civilian casualties. In fact Vietnam was never a democracy. It is important to remember that without popular support, which is the basis of any national resistance movement, the Iraqi Resistance would not be able to operate. Of significance, is that after two years of U.S. brutality and violence, Iraqi Resistance groups have been able to integrate, modify their methods and fight effectively against the biggest military machine in history. While there are foreign volunteers fighting alongside Iraqis, there is no evidence of “foreign fighters” such as the Salafi and Wahhabi sects (of Saudi Arabia) in the Resistance movement. This is part of the U.S.-created Al-Zarqawi myth, much more useful than the myth of WMD. The Occupation forces have yet to provide concrete evidence of these “foreign fighters”, let alone evidence to substantiate the presence of Al-Zarqawi. From an Iraqi perspective, the “foreigners” in Iraq are U.S. soldiers and mercenaries from Britain, Italy, Australia, South Korea and Japan, etc. Moreover, there is, in this regard, a clear distinction between “insurgents” and “resistance”. The term “insurgent” used profusely by mainstream and alternative journalists alike tends again to denigrate the resistance, while upholding the legitimacy of the Occupation, which is directed against the “insurgents”. “Many of the resistance groups are bigoted Sunni Arab fanatics who see Shia [sic] as well as US soldiers as infidels whom it is a religious duty to kill. Others are led by officers [sic] from Saddam’s brutal security forces. But Washington never appreciated the fact that the US occupation was so unpopular that even the most unsavoury groups received popular support…[U.S. forces] massive firepower meant they won any set-piece battle, but it also meant that they accidentally killed so many Iraqi civilians that they were the recruiting sergeants of the resistance”. (CounterPunch, 16 May 2005). And what evidence is offered in support of these assertions? While the US led occupation is intent on fomenting social divisions and religious hatred, there is ample evidence of a mass movement where Sunnis and Shiites have in fact joined hands in opposing the US led occupation. This over-armed military machine is unpopular because it kills so many Iraqi civilians “accidentally”. Remember, that more than 100,000 Iraqi civilians, most of them innocent women and children have been killed and continue to be killed “accidentally”. And the total destruction of the vibrant city of Fallujah, and the killing of more than 6,000 innocent civilians, using napalm bombs deliberately designed to kill many civilians in densely populated areas, is just by “accident”. The rate of civilian deaths in Iraq under U.S. Occupation is far greater than anything perpetrated by the regime of Saddam Hussein. U.S. forces are provided with “immunity” from prosecution, making it very easy for them to kill Iraqis with institutionalized impunity, as if Iraqis were not even human beings. The criminal practice emanates from the Pentagon; it is created by the U.S. government to encourage U.S. recruits into more wars of aggression. All Iraqis, including the Resistance leaders and leaders of the influential Association of Muslim Scholars (AMS), and others have rejected the attacks against civilians and has blamed U.S. forces and their allies for orchestrating the violence. Mr. Harith Al-Dhari, the head of the AMS, publicly blamed the Badr Brigades for the recent spate of killings of Sunni Muslim clerics in the country. “The parties that are behind the campaign of killings of preachers of mosques and worshippers are…the Badr Brigades. [They] are responsible for the escalating tensions”, Mr. Al-Dhari told Al-jazeera. “Which religion allows anyone to kill more than 100 Iraqis, destroy 100 families and destroy 100 houses?” ….”Who are those people who do this? Where did they come from?…[This] is a conspiracy to defame the reputation of the Iraqi [R]esistance by wearing its dress and using its name falsely”, Cleric Ahmed Abdul Ghafour Samarrae told Edward Cody of The Washington Post in 2004. “Any action targeting civilians is forbidden under any circumstances”, Sayyid Muqtada Al-Sadr told AFP. “The occupiers are trying to sow division among the Iraqi people, but there are no Sunnis and Shiites. Iraqis are one. It is not acceptable to direct to the Sunnis the allegations of ugly acts committed by the occupier against the Shiites”, said Al-Sadr. As I wrote previously, the Resistance is a homegrown movement of several Iraqi groups taking directions from members of their respective communities. Whatever the religious and political affiliation of the Resistance, the main aim is the liberation of Iraq from U.S. forces. “[The Resistance] intellectual tendencies are usually described as a mixture of Islamic and pan-Arab ideas that agree on the need to put an end to the US presence in Iraq”, wrote Samir Haddad and Mazin Ghazi of the Baghdad weekly Al-Zawra. “These groups have common denominators, the most important of which perhaps are focusing on killing US soldiers, rejecting the abductions and the killing of hostages, rejecting the attacks on Iraqi policemen, and respecting the beliefs of other religions”, added Haddad and Ghazi. According to Molly Bingham writing in the Boston Globe, a journalist and a fellow at Harvard University, who spent some time with a group of Resistance fighters in Iraq: “I met Shia [sic] and Sunnis fighting together, women and men, young and old. I met people from all economic, social, and educational backgrounds…The original impetus for almost all of the individuals I spoke to was a nationalistic one”. “Embedded journalism is an obvious source of disinformation. It fosters false optimism regarding the US military presence. It means reporters are only present where American troops are active, though US forces seldom venture into much of Iraq. Embedded correspondents bravely covered the storming of Fallujah by US marines last November and portrayed it as a US military success.” (CounterPunch, 16 May 2005). “We can’t simply turn our backs on the million of Iraqis – who lack basic necessities like, water electricity food or medical care…. It is immoral for us to leave them to die in the cross fire of a violent civil war fuelled by extremists that we created…We must take the president at his word and force him to deliver on the promise of freedom.” (AlterNet, 06 January 2005). In other words, should “Progressives” trust George Bush’s “messianic mission” and “stay the course” in Iraq to “promote democracy” and “prevent” civil war; anything short of this, would be “immoral”. This lie is from George Bush’s own pack of lies. It is not only supported by rightwing pundits and pro-war advocates but also by part of the U.S. Liberal “anti-war” movement, which points to the Resistance as the primary source of violence in Iraq. The reality is that the so-called U.S. “democratic occupation”, is a euphemism for imperialist occupation and oppression. As I write these lines, U.S. forces are bombing Iraqi civilians in their homes. In the town of Qaim, on the Syrian border, U.S. forces have besieged the town for many days. Residents told IPS on telephone; “all the fighters here are Iraqis from this area”. The on going abuses by U.S. soldiers had provoked people into confronting the occupying forces. “The fighters are just local people who refuse to be treated like dogs,” one resident said. “Nobody wants the Americans here”, added another resident. Many innocent civilians have been killed and the city centre “has been almost completely destroyed”, including the city hospitals and schools. “[The Americans] are using warplanes, mortar shells and tanks to shell the city indiscriminately, hurt citizens and bomb the houses with warplanes”. Like the atrocity of Fallujah, the silence of the Western media is deafening, while Iraqi cities and towns are destroyed one by one. It appears that the common agenda of Western governments led by the U.S. and Britain is the revival of the old Western colonialism masked in the fake rhetoric of “democracy” and “liberation”. Like Western governments, Western media have bought into the so-called “federation of Iraq”, a euphemism to divide Iraq into colonies controlled by Western powers. Once again the media have failed to report the US led policy of ethnic cleansing, conducted by Kurdish terrorist groups from northern Iraq, particularly from the city of Kirkuk. Thousands of Iraqi (Arabs and Turkomans) families, who lived for generations in northern Iraq, are forced by armed Kurdish Peshmerga to flee their homes and seek sanctuaries further south. Today, the ethnic cleansing of Iraqis is comparable to that conducted against the Palestinian people in 1948 by Zionist terrorists. The fact that Israeli commandos are in northern Iraq training the Kurdish militias in the art of land dispossession is a case in point. The people of Iraq do not wish to live under U.S. Occupation and voted against the U.S. presence in their country. The Western media distorts what is happening in Iraq in order to provide legitimacy to the US government’s agenda. The majority of Iraqis (nearly 98 per cent) want the U.S. forces to leave their country, and 92 percent of Iraqis see the Americans as imperial occupiers rather than “liberators”. Clearly, Western journalists and pundits have shown that they lack an accurate understanding of Iraq’s history and Iraqi society. Most reports out of Iraq have been always from a Western perspective, but rarely from an Iraqi perspective. It would take Westerners a long time to understand the situation in Iraq today, including the general relationship between Islam and politics. 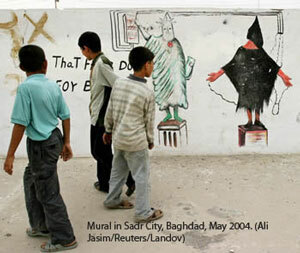 Historically, Islam and politics in Iraq and many other Muslim countries have been inseparable. “Thus, the demand for the separation of religion and state in Muslim countries is more than secularist; it is openly [anti-Islam]”, wrote the French academic Gilbert Achcar. Even Saddam Hussein, identified with Islam as part of the battle against imperialism. Today’s Islam, however, is largely secular and concerned more with political and social issues rather than religious. Sectarianism and ethnic tensions in Iraq “are not a product of cultural differences. They are the product of a history of imperialism and colonialism in the region and domestic Iraqi politics”. “This applies as much to the Arab-Kurd tension as it does to the Sunni-Shias [sic]”, wrote Rami El-Amine of Left Turn magazine. Iraq is a mosaic society. “There is no history of communal strife or civil war in Iraq, and the degree of socioeconomic integration and unity of purpose amongst the Iraqi people is often underestimated. There is also a powerful secular tradition in Iraq that transcends all religions and sects”, said Dr. Sami Ramadani of London Metropolitan University. Iraqis are united against the Occupation. If there is any divide, this “divide, already narrower in Iraq than in some parts of the Arab world, is by all accounts shrinking each day that Iraqis agree their most immediate problem is the occupation”, wrote The Washington Post correspondent R. Chandrasekaran. Only two years ago, Iraqi Christians, and Muslims lived together in harmony despite their religious and political differences. If there is any division between Iraqis today, the division has been created quite deliberately by the U.S. Occupation. The April 19, 2005 demonstration of more than 300,000 Iraqis in Baghdad alone (the largest in Iraq for many decades), jointly organized by the Al-Sadr movement and the Association of Muslim Scholars, showed that all Iraqis are united against the US Occupation and terrorism. This unity contradicts the West’s perception of Iraqis as a divided society and rejects the occupiers’ imperialist policy of ‘divide and rule’. As a result of media disinformation, many people in the West, Americans in particular, continue to support an illegal war of “crimes against humanity” perpetuated in their name. The Western media should follow an ethic of moral responsibility toward the Iraqi people and provide impartial and accurate information to the outside world. To defend their country, the Iraqi people have a legitimate right to resist, and use all forms of resistance to this war and occupation. Any resistance to the current imperial aggression is legitimate resistance. “International law grants a people fighting an illegal occupation the right to use ‘all necessary means at their disposal’ to end their occupation and the occupied are entitled to seek and receive support”. Instead of serving as propaganda agents for imperial power and an unjust war against the Iraqi people’s right to self-determination, the Western media would do well to hold the governments behind the US led coalition accountable for this illegal act of aggression. Those who are responsible for this murderous crime against the Iraqi people should face, with their accomplices, war crimes trials similar to those conducted by the Nuremberg Tribunal. The only peaceful solution to the chaos in Iraq is the full withdrawal of U.S. forces. Ordinary Iraqis and the Iraqi Resistance groups will continue to resist the Occupation until the U.S. leaves Iraq. No amount of U.S. firepower will quell the desire of the people of Iraq to achieve sovereignty and national independence.